Eugene Cyril Smith III (born October 10, 1990) is an American football quarterback who is currently a free agent. He played college football at West Virginia and was drafted by the New York Jets in the second round of the 2013 NFL Draft. He has also played for the New York Giants and Los Angeles Chargers. Smith was born to Eugene Smith, Jr. and Tracy Seller in Lakemont, Georgia on October 10, 1990. His great-uncle, Danny Smith was a record breaking All-American hurdler at Florida State, and his cousin Melvin Bratton was a star running back at Miami in the mid-1980s. His nickname, Geno, came from his grandfather, who was nicknamed "Big Geno". He was admitted to Norland Middle School's magnet program, which dedicated two hours a day to arts instruction. He would go on to attend Miramar High School where he was coached by former Mountaineer Damon Cogdell. As a junior, he passed for 2,200 yards 25 touchdowns and three interceptions and was named Second Team All-State QB. He was also named Second Team All-Broward County as an athlete for 2007. Following his junior year he was invited to the prestigious Elite 11 Quarterback Camp in Aliso Viejo, California. During Smith's senior season, he led his team to the state 6A semi-finals and completed 205 of 338 passes for 3,089 yards and 30 touchdowns while also rushing for over 300 yards. He was an All-State First Team in Florida Class 6A and a Parade All-American. He was also the No. 1 rated player in Broward County according to the Miami Herald and South Florida Sun Sentinel and finished No. 2 in the voting for Mr. Florida. He finished his career as the third-best passer in Broward County history, and was named to the ESPN Top 150 prospects list. He chose to attend West Virginia over offers from Florida State, South Florida, Boston College, and Alabama. "West Virginia Football Commitments". Rivals.com. Retrieved March 12, 2013. "2009 West Virginia Football Commits". Scout.com. Retrieved March 12, 2013. "ESPN". ESPN.com. Retrieved March 12, 2013. "Scout.com Team Recruiting Rankings". Scout.com. Retrieved March 12, 2013. "2009 Team Ranking". Rivals.com. Retrieved March 12, 2013. Smith attended West Virginia University, where he played for the West Virginia Mountaineers football team from 2009 to 2012. He was an English major during his time at West Virginia. Smith saw some action his freshman year as the backup behind senior Jarrett Brown. His first snap in a regular season game came against Auburn; he completed 5 of 8 passes for 50 yards and one interception. He would see action again against Syracuse, Marshall, Louisville, and in the Gator Bowl against Florida State. In his freshman year at West Virginia University, Smith completed 32 of 49 passes for 309 yards, throwing one touchdown and one interception, and rushing for 7 yards on 17 attempts as the backup to starting quarterback Brown. He finished his freshman season with an 81.1 quarterback rating. 2010 was Smith's first year as the starting quarterback. For the year, he completed 241 of 372 passes for 2,763 yards, throwing 24 touchdowns and 7 interceptions, and rushing for 217 yards on 106 attempts. He got his first start in the season opener against the Coastal Carolina Chanticleers. He completed 20 of 27 passes for 216 yards, two touchdowns, and one interception in the 31–0 victory. With the Mountaineers down 21–6 against in-state rival, Marshall, Smith led his team to a 4th quarter comeback victory. Smith led the first drive from the Mountaineers' 4-yard line. With help from senior running back Noel Devine, the Mountaineers cut Marshall's lead to 8 points. After the Mountaineers' defense stopped Marshall, a punt put the Mountaineers near their own end zone again, starting from the 2-yard line. After completing 9 of 13 passes and scrambling for 20 yards, Smith found tight end Will Johnson in the corner of the endzone for a touchdown. With Marshall still leading 21–19, head coach Bill Stewart elected to go for the two-point conversion. Smith completed a pass to wide receiver Jock Sanders in the back of the end zone for a two-point conversion. The Mountaineers went on to win the game in overtime by a score of 24–21. Smith finished the game completing 32 of 45 passes for 316 yards and one touchdown. He rushed for 13 yards on 14 attempts. After two games, Smith lead the Big East in passing yards and passing efficiency. In a 31–17 victory over Maryland, Smith completed 19 of 29 pass attempts for 268 passing yards and four touchdowns. Two of his touchdowns were to Tavon Austin, and two were to Stedman Bailey. Smith won his first Big East Offensive Player of the Week for this performance. In West Virginia's first meeting ever with LSU, the Mountaineers lost at Tiger Stadium by a score of 20–14. Smith completed 14 of 29 pass attempts for 119 yards, two touchdowns, and one interception. He rushed for 10 yards on five attempts. Smith threw for 220 yards and ran for 19 yards in West Virginia's 49–10 win over UNLV. It was the most points WVU had scored since playing Connecticut in 2007. In a 16–13 overtime loss to Connecticut, Smith was 22 for 34, throwing for 160 yards. He had a season high of 64 rushing yards. This was the first game all season Smith did not throw a touchdown pass. The loss was the first time Connecticut had ever beaten West Virginia. Smith tied his record for touchdowns in a game in a 37-10 win over Cincinnati, where he was 15 for 25, throwing for 174 yards, four touchdowns, and one interception. The win came after a two-game losing streak. It was the first time the Mountaineers beat Cincinnati since 2007. Smith won his second Big East Offensive Player of the Week for this performance. On November 26, against Pittsburgh, he finished with 212 passing yards and three touchdowns in the 35–10 victory. In the next game against Rutgers, he had 352 passing yards and a touchdown in the 35–14 victory. He finished the 2010 season with 196 passing yards, one touchdown, and one interception in the 23–7 loss to North Carolina State in the Champs Sports Bowl. Overall, in his sophomore season, Smith finished with 2,763 passing yards, 24 touchdowns, and seven interceptions. With the arrival of new West Virginia football head coach Dana Holgorsen and a new passing-based offensive system, Smith saw his passing numbers improve drastically. In the fourth game of the season against the #2 LSU Tigers, Smith set school records for completions (38), attempts (65), and passing yards (463) in the 47–21 loss on September 24, 2011. With 372 passing yards against the Cincinnati Bearcats on November 12, Smith tied a Big East record with his seventh 300-yard game of the season. He tied the record that was set in 2007 by Brian Brohm of the Louisville Cardinals. He set single-season school records for pass completions (291), attempts (448) and yards (3,741) on November 25 in a win against the rival Pittsburgh Panthers. All three records were previously held by Marc Bulger. In West Virginia's 70–33 rout of the Clemson Tigers in the 2012 Orange Bowl Smith tied three individual bowl records: most touchdown passes (six), most touchdowns overall (seven) and total points (42). Smith's 401 passing yards broke Tom Brady's Orange Bowl record of 396 that he set in the 2000 Orange Bowl. Smith also became the Big East single-season passing leader with 4,379 yards, breaking Brian Brohm's mark that he set in 2007. As a senior, Smith put together some great statistical performances for the Mountaineers. In the season opening victory over Marshall, he finished 32-of-36 for 323 yards and four touchdowns. In the next game, a victory over James Madison, he finished 34-of-39 for 411 yards and five touchdowns. On September 29, against Baylor, he had a career-day going 45-of-51 for 656 yards and eight touchdown passes in the 70–63 victory. In the next game, a victory over Texas, he finished with 268 passing yards and four touchdowns to help lead the Mountaineers to a 5–0 record. After the win over Texas, the season started to falter for the Mountaineers. Despite some solid individual results, Smith and the Mountaineers dropped the next five games. On November 23, Smith had 236 passing yards and two touchdowns in a victory over Iowa State to stop the losing streak. In the regular season finale against Kansas, he finished 23-of-24 for 407 yards, three touchdowns, and one interception in the 59–10 victory. In the Pinstripe Bowl against Syracuse, he finished with 201 passing yards and two touchdowns in the 38–14 loss. Overall, in the 2012 season, Smith finished the season with 4,205 passing yards, 42 touchdowns, and 6 interceptions. After the season, Smith officially announced to enter the 2013 NFL Draft. Smith received an invitation to the NFL Scouting Combine where his performance was well received by scouts who highlighted his athleticism and strong arm but noted his ball placement needed improvement. Smith was widely regarded as one of the top prospects alongside EJ Manuel of Florida State. In the days leading up to the draft, several NFL teams expressed interest in Smith including the Kansas City Chiefs (No. 1 selection), the Jacksonville Jaguars (No. 2 selection), the Oakland Raiders (No. 3 selection), the Philadelphia Eagles (No. 4 selection), the Buffalo Bills (No. 8 selection), and the New York Jets (No. 9 and No. 13 selections). Smith at New York Jets' training camp in 2013. Smith was in attendance for the first round of the draft as many analysts and scouts expected him to be taken that night however he was not selected; EJ Manuel was the lone quarterback taken in the first round. Smith declined to be interviewed by ESPN afterwards and originally planned to return home but later decided to attend the second day of the draft. Several league executives alleged Smith did not handle the draft process in a professional manner which caused him to fall out of the first round while analysts pointed to his late-season decline as a senior at West Virginia, which exposed his flaws, as the primary reason. The following day, the Jets expressed interest in trading up in the second round to select Smith but couldn't consummate a trade. Despite this, Smith remained available and the Jets selected him with the 39th overall pick. General manager John Idzik, following the selection, stated Smith would compete with incumbent Mark Sanchez in training camp to determine the starting quarterback. Smith fired his agency, Select Sports Group, upon the completion of the draft and sought new representation. He signed with Roc Nation Sports on May 22, 2013 with Kimberley Miale serving as his representative. Smith worked out in his home state of Florida during the offseason, prompting questions as to whether or not he had spurned Sanchez by not attending Sanchez's Jets West summer camp in California. Smith and Sanchez dismissed this notion with Sanchez saying that it was 'no big deal.' Smith signed a four-year, $5 million contract on July 22, 2013 with approximately $690,000 in workout bonuses. Smith made his professional debut in the preseason on August 9, 2013 against the Detroit Lions. He completed 6-of-7 passes for 47 yards but left the game due to an ankle injury in the second quarter. X-rays showed no structural damage and Smith returned to practice on August 11. Smith started the Jets' third preseason game against the New York Giants completing 16 of 30 passes for 199 yards, a touchdown, and four turnovers. Smith was named the team's starting quarterback on September 4 after Sanchez suffered a shoulder injury against the Giants. In his first regular season game against the Tampa Bay Buccaneers, Smith completed 24-of-38 passes for 256 yards and a touchdown. With only a few seconds left in the fourth quarter, Smith was hit out of bounds by Lavonte David, which drew a late hit penalty and the Jets went on to score the game-winning field goal. In Week 2 against the New England Patriots, Smith struggled as he completed 15 of his 35 passes for 214 yards, a touchdown and three interceptions, as the Jets lost 10–13. In Week 3 against the Buffalo Bills, Smith completed 16 of his 29 passes for 331 yards, rushing for a touchdown and passing for two touchdowns and two interceptions as the Jets won 27–20. Smith became the first rookie quarterback in franchise history to throw for 300 or more yards in a game. Smith struggled Week 4 against the Tennessee Titans. He completed 23 of his 34 passes for 289 yards and a touchdown while committing four turnovers—two led to Titans touchdowns as the Jets lost 13–38. The Jets faced the Atlanta Falcons on Monday Night Football in Week 5; Smith completed 16 of his 20 passes for 199 yards and three touchdowns. He completed all four of his passes on the Jets' final drive, allowing Nick Folk to kick the game-winning 43-yard field goal. Smith was named AFC Offensive Player of the Week and the Pepsi NFL Rookie of the Week for his performance. In Week 6 against the Pittsburgh Steelers, Smith threw for 201 yards and two interceptions as the Jets lost, to the previously winless Steelers, 6–19. In Week 7, the Jets played the New England Patriots; Smith completed 17 of his 33 passes for 233 yards and scored two touchdowns as the Jets won 30–27 in overtime. Smith struggled in the Jets' Week 8 loss against the Cincinnati Bengals as he completed 20-of-30 passes for 159 yards but threw two interceptions that were returned for touchdowns before being replaced by Matt Simms in the fourth quarter. Smith started the following week against the New Orleans Saints; he completed 8 of his 19 passes for 115 yards and a rushing touchdown in a 26–20 upset of the Saints. The Jets returned from their bye week to lose three straight contests to the Bills, Ravens and Dolphins. Smith struggled during this stretch as he failed to score any points and committed eight turnovers; he was benched in favor of Simms against Buffalo and Miami leading coach Rex Ryan to be noncommittal in starting Smith the rest of the year. Smith showed gradual improvement as the Jets won three of their final four games. Against the Raiders, Smith completed 16 of his 25 passes for 219 yards and scored twice in the Jets' 37–27 win that kept the team in playoff contention. The following week, the Jets played the Carolina Panthers. Smith performed well until throwing a costly pick six in the fourth quarter. The Jets lost 30–20 and were eliminated from playoff contention. Smith finished the game completing 15 of his 28 passes for 167 yards, a touchdown and interception. The Jets won their next contest against the Browns with Smith completing 20-of-36 passes for 214 yards and three touchdowns. In 20–7 win over the Miami Dolphins in his season finale, Smith completed 17-of-27 passes for 190 yards and a touchdown as the loss eliminated Miami from playoff contention. Smith completed his rookie season with 3,046 yards, 12 touchdowns and 21 interceptions. Smith was named the starter for the 2014 season on August 22, 2014. Smith opened the season passing for 221 yards and throwing a touchdown and an interception in a 19–14 victory over the Oakland Raiders. During Week 2 against the Green Bay Packers, Smith passed for 176 yards and rushed for a touchdown but had an interception in the 31-24 loss. During Monday Night Football against the Chicago Bears in Week 3, Smith's very first play resulted in an interception returned for a touchdown by Ryan Mundy. Smith finished the game with 316 passing yards, a touchdown and 2 interceptions as the Jets lost to the Bears 27-19. During Week 4 against the Detroit Lions, Smith threw for 209 yards with an interception and a lost fumble during the 24-17 loss. On October 3, 2014, Smith was fined $12,000 for yelling profanity at fans while walking to the locker room during halftime in Week 4. Despite this incident, he was allowed to start in Week 5 against the San Diego Chargers, in which he threw for only 27 yards with an interception and was benched for the second half in favor of Michael Vick as the Jets were shut out 31-0. Prior to the Week 5 game, Smith missed a team meeting, eventually admitting that he went to a movie theater in San Diego, unaware that the eastern and pacific time zones had a three-hour difference. Smith started in Week 6 against the Denver Broncos, throwing for 190 yards, two touchdowns, and an interception in a 31-17 loss. During Thursday Night Football against the Patriots in Week 7, Smith threw for 226 yards and the Jets combined for 218 rushing yards but an ensuing game-winning drive fell short due to a blocked field goal as the Jets lost 27-25. On October 26, 2014 Smith went 2-of-8 and threw three interceptions before the end of the first quarter against the Bills and was subsequently benched in favor of Michael Vick. His passer rating for that game was 0.04. On the final regular season game at Miami, Smith lead the Jets to a 37-24 victory. Smith passed for a career-high 358 yards, three touchdowns, and no interceptions, completing 20-of-25 attempts for a perfect passer rating. This was Smith's first perfect game, the sixth in Jets history, and the only one of the 2014 season. For the 2014 season, Smith finished the season with 2,525 passing yards, 13 touchdowns, and 13 interceptions in 14 games (13 starts). On August 11, 2015, Smith was involved in an altercation with defensive end IK Enemkpali in the locker room. Smith suffered a fractured jaw after Enemkpali punched him in the face. Smith was ruled out for 6–10 weeks, and Enemkpali was released by the Jets shortly thereafter. Two days later, Smith underwent surgery on his fractured jaw. Ryan Fitzpatrick led the team to a 2–0 record while Smith was injured, so new head coach Todd Bowles decided to continue starting Fitzpatrick, even with Smith being healthy. On November 1, 2015, Smith entered the Jets' game against the Oakland Raiders in relief of Fitzpatrick, who left the game with an injured thumb. Smith threw 42 passing attempts, with 27 completions, two touchdowns, and one interception in the 20–34 loss. This was Smith's only appearance in a game in 2015. With Ryan Fitzpatrick re-signing with the Jets, Smith continued to remain in the backup role. During Week 6 against the Arizona Cardinals, Smith came in relief for Fitzpatrick for the first time in the 2016 season due to the Jets being down 28–3 and an unpleasant performance by Fitzpatrick during the first three quarters. Two days later, Smith was named starter for the following game in place of the struggling Fitzpatrick. Making the start in Week 7 against the Baltimore Ravens, Smith had 95 passing yards until leaving the game with an apparent knee injury. Fitzpatrick would later lead the Jets to a 24-16 victory over the Ravens. The next day, it was revealed that Smith had a torn ACL, effectively ending his 2016 season. He was placed on injured reserve on October 26, 2016. On March 28, 2017, Smith signed with the New York Giants. On November 5, 2017, during Week 9 against the Los Angeles Rams, Smith came in the game in relief of Eli Manning late in the 4th quarter. Smith finished with only two incomplete passes, as the Giants lost 51–17. On November 28, 2017, the Giants named Smith the starter for the upcoming game against the Raiders, which ended Manning's 210-game starting streak with the Giants. The start made Smith the first black quarterback to start for the Giants and the first quarterback to start for both the Giants and the Jets; it also meant every NFL team had started a black player at quarterback, with the Giants being the last team to do so. Making his first start with the Giants on December 3, 2017 against the Raiders, Smith finished with 212 passing yards and a touchdown but had two first-half fumbles within the Raiders' 30 yard line and the Giants lost, 24–17. On December 5, Manning was renamed the starter. On April 1, 2018, Smith signed a one-year contract with the Los Angeles Chargers. During Week 6, Smith made his first appearance with the Chargers, completing one pass for eight yards as the Chargers won 38–14 over the Cleveland Browns. Overall, Smith appeared in five games in the 2018 season in relief roles. Smith is a Christian and frequently posts about his faith on his Twitter account. ^ a b "Bimini 'sports' tradition continues through Smith". ^ Martin, Kimberly A. (August 3, 2013). "Geno Smith keeps his late grandmother close to his heart". Newsday. Retrieved March 26, 2018. Mosetta Bratton always believed her grandson -- named Eugene Cyril Smith III after his father, nicknamed "Big Geno," and his paternal grandfather -- would be something special. ^ "Geno Smith and the Art of Quarterbacking at West Virginia". The New York Times. September 28, 2012. ^ a b c http://recruiting.scout.com/a.z?s=73&p=8&c=1&nid=3333654%7C Scout.com. Retrieved March 6, 2013. ^ http://sports.espn.go.com/ncaa/recruiting/football/notebook?page=peprally/081114%7C Espn.go.com. Retrieved March 6, 2013. ^ "Geno Smith College Stats". College Football at Sports-Reference.com. Retrieved January 26, 2018. ^ "2009 West Virginia Mountaineers Stats". College Football at Sports-Reference.com. Retrieved May 20, 2018. ^ "West Virginia at Auburn Box Score, September 19, 2009". College Football at Sports-Reference.com. Retrieved January 26, 2018. ^ "Gator Bowl - West Virginia vs Florida State Box Score, January 1, 2010". College Football at Sports-Reference.com. Retrieved January 26, 2018. ^ "Geno Smith 2009 Game Log". College Football at Sports-Reference.com. Retrieved January 26, 2018. ^ "West Virginia at Marshall | Friday September 10, 2010 | NCAAF - Yahoo! Sports". Rivals.yahoo.com. Retrieved September 30, 2012. ^ "West Virginia at Marshall Box Score, September 10, 2010". College Football at Sports-Reference.com. Retrieved January 26, 2018. ^ a b "Maryland at West Virginia | Saturday September 18, 2010 | NCAAF - Yahoo! Sports". Rivals.yahoo.com. Retrieved September 30, 2012. ^ "Maryland at West Virginia Box Score, September 18, 2010". College Football at Sports-Reference.com. Retrieved January 26, 2018. ^ "West Virginia at LSU | Saturday September 25, 2010 | NCAAF - Yahoo! Sports". Rivals.yahoo.com. Retrieved September 30, 2012. ^ "UNLV at West Virginia | Saturday October 9, 2010 | NCAAF - Yahoo! Sports". Rivals.yahoo.com. Retrieved September 30, 2012. ^ "West Virginia routs UNLV 49-10 - College Football - Rivals.com". Rivals.yahoo.com. Retrieved September 30, 2012. ^ "UConn beats West Virginia 16-13 in overtime - College Football - Rivals.com". Rivals.yahoo.com. Retrieved September 30, 2012. ^ "Cincinnati at West Virginia Box Score, November 13, 2010". College Football at Sports-Reference.com. Retrieved January 26, 2018. ^ "West Virginia beats Cincinnati 37-10 - College Football - Rivals.com". Rivals.yahoo.com. Retrieved September 30, 2012. ^ "West Virginia at Pittsburgh Box Score, November 26, 2010". College Football at Sports-Reference.com. Retrieved January 26, 2018. ^ "Rutgers at West Virginia Box Score, December 4, 2010". College Football at Sports-Reference.com. Retrieved January 26, 2018. ^ "Champs Sports Bowl - West Virginia vs North Carolina State Box Score, December 28, 2010". College Football at Sports-Reference.com. Retrieved January 26, 2018. ^ "Geno Smith 2010 Game Log". College Football at Sports-Reference.com. Retrieved January 26, 2018. ^ "LSU at West Virginia Box Score, September 24, 2011". College Football at Sports-Reference.com. Retrieved January 26, 2018. ^ "West Virginia at Cincinnati Box Score, November 12, 2011". College Football at Sports-Reference.com. Retrieved January 26, 2018. ^ "Pitt at West Virginia Box Score, November 25, 2011". College Football at Sports-Reference.com. Retrieved January 26, 2018. ^ "West Virginia Mountaineers Passing". College Football at Sports-Reference.com. Retrieved January 26, 2018. ^ "Orange Bowl - West Virginia vs Clemson Box Score, January 4, 2012". College Football at Sports-Reference.com. Retrieved January 26, 2018. ^ "West Virginia routs Clemson in record-setting Orange Bowl". ESPN.com. January 4, 2012. Retrieved January 5, 2012. ^ "Marshall at West Virginia Box Score, September 1, 2012". College Football at Sports-Reference.com. Retrieved January 26, 2018. ^ "West Virginia vs James Madison Box Score, September 15, 2012". College Football at Sports-Reference.com. Retrieved January 26, 2018. ^ "Baylor at West Virginia Box Score, September 29, 2012". College Football at Sports-Reference.com. Retrieved January 26, 2018. ^ "West Virginia at Texas Box Score, October 6, 2012". College Football at Sports-Reference.com. Retrieved January 26, 2018. ^ "West Virginia at Iowa State Box Score, November 23, 2012". College Football at Sports-Reference.com. Retrieved January 26, 2018. ^ "Kansas at West Virginia Box Score, December 1, 2012". College Football at Sports-Reference.com. Retrieved January 26, 2018. ^ "Pinstripe Bowl - West Virginia vs Syracuse Box Score, December 29, 2012". College Football at Sports-Reference.com. Retrieved January 26, 2018. ^ "Geno Smith 2012 Game Log". College Football at Sports-Reference.com. Retrieved January 26, 2018. ^ "Geno Smith". SR/College Football. Archived from the original on June 9, 2014. Retrieved June 9, 2014. ^ Pauline, Tony (February 25, 2013). "Grading QB workouts: Geno Smith remains best in draft". USA Today. Archived from the original on July 23, 2013. Retrieved July 23, 2013. ^ Rang, Rob (February 24, 2013). "2013 NFL Combine: Geno Smith fails to wow during passing drills". CBS Sports. Archived from the original on July 23, 2013. Retrieved July 23, 2013. ^ Orr, Conor (April 17, 2013). "NFL Draft 2013: Geno Smith is consensus top-rated quarterback available". The Star-Ledger. Archived from the original on July 23, 2013. Retrieved July 23, 2013. ^ Corbett, Jim (March 29, 2013). "Geno Smith hopes Chiefs are 'legitimately interested'". USA Today. Archived from the original on July 23, 2013. Retrieved July 23, 2013. ^ "NFL Events: Combine Player Profiles–Geno Smith". National Football League. Archived from the original on February 28, 2013. Retrieved February 26, 2013. ^ McGinn, Bob (April 19, 2013). "Rating the NFL draft prospects: Quarterbacks". Milwaukee-Wisconsin Journal Sentinel. Archived from the original on June 5, 2013. Retrieved June 4, 2013. ^ Rosenthal, Gregg (April 10, 2013). "Geno Smith, EJ Manuel among 2013 NFL Draft attendees". National Football League. Archived from the original on July 23, 2013. Retrieved July 23, 2013. ^ a b "Manti Te'o, Geno Smith passed over". ESPN. Associated Press. April 26, 2013. Archived from the original on July 23, 2013. Retrieved July 23, 2013. ^ Cole, Jason (May 1, 2013). "Geno Smith's firing of agents, pre-draft actions shed light on why QB may have dropped". Yahoo! Sports. Archived from the original on July 23, 2013. Retrieved July 23, 2013. ^ Breer, Albert (May 7, 2013). "Draft notes: EJ Manuel over Geno Smith not that surprising". National Football League. Archived from the original on July 23, 2013. Retrieved July 23, 2013. ^ Gantt, Darin (April 26, 2013). "Report: Jets want to move up from 39, eying Geno Smith". ProFootballTalk. Archived from the original on July 23, 2013. Retrieved July 23, 2013. ^ Klemko, Robert (April 26, 2013). "Shocker: Jets draft Geno Smith in second round". USA Today. Archived from the original on July 23, 2013. Retrieved July 23, 2013. ^ Florio, Mike (May 6, 2013). "Geno Smith narrows agent options to three". ProFootballTalk. Archived from the original on July 23, 2013. Retrieved July 23, 2013. ^ Heitner, Darren (May 22, 2013). "Jay-Z's Roc Nation Sports Signs New York Jets QB Geno Smith". Forbes. Archived from the original on July 23, 2013. Retrieved July 23, 2013. ^ "Geno Smith won't attend Mark Sanchez's Jets camp". USA Today. Associated Press. July 12, 2013. Archived from the original on July 23, 2013. Retrieved July 23, 2013. ^ Hanzus, Dan (July 16, 2013). "Geno Smith: Mark Sanchez and I have 'no hard feelings'". National Football League. Archived from the original on July 23, 2013. Retrieved July 23, 2013. ^ Cimini, Rich (July 22, 2013). "It's official: Geno's a Jet". ESPN New York. Archived from the original on July 23, 2013. Retrieved July 23, 2013. ^ Cimini, Rich (July 22, 2013). "Report: Geno's deal tied to workouts". ESPN New York. Archived from the original on July 23, 2013. Retrieved July 23, 2013. ^ a b Slater, Darryl (August 10, 2013). "Geno Smith optimistic about his sore ankle and debut night performance in Detroit". The Star-Ledger. Archived from the original on August 10, 2013. Retrieved August 10, 2013. ^ Mehta, Manish (August 11, 2013). "Geno Smith plays through ankle pain at NY Jets practice". New York Daily News. Archived from the original on August 12, 2013. Retrieved August 12, 2013. ^ Cimini, Rich (August 25, 2013). "Smith throws 3 picks; Sanchez hurt". ESPN New York. Archived from the original on August 26, 2013. Retrieved August 26, 2013. ^ Corbett, Jim (September 8, 2013). "Penalty in final seconds helps Jets edge Buccaneers". USA Today. Archived from the original on September 14, 2013. Retrieved September 9, 2013. ^ Martin, Kimberley (September 12, 2013). "Geno Smith throws 3 interceptions in loss to Patriots". Newsday. Archived from the original on September 14, 2013. Retrieved September 14, 2013. ^ Slater, Darryl (September 22, 2013). "Jets down Bills, 27-20, in an ugly, penalty-filled outing". The Star-Ledger. Archived from the original on September 23, 2013. Retrieved September 23, 2013. ^ "Despite some rookie errors, QB Geno Smith giving Jets a lot to feel good about". The Washington Post. Associated Press. September 25, 2013. Archived from the original on September 27, 2013. Retrieved September 26, 2013. ^ a b Slater, Darryl (September 29, 2013). "Jets come undone in 38-13 loss to Titans, dropping to 2-2 on season". The Star-Ledger. Archived from the original on October 9, 2013. Retrieved October 9, 2013. ^ a b ESPN Stats & Information (October 8, 2013). "Smith's poise wins out for Jets". ESPN. Archived from the original on October 9, 2013. Retrieved October 9, 2013. ^ Slater, Darryl (October 8, 2013). "Jets kicker Nick Folk continues strong season with game-winning, 43-yard field goal". The Star-Ledger. Archived from the original on October 9, 2013. Retrieved October 9, 2013. ^ Jets Staff (October 9, 2013). "Geno Smith Named AFC Offensive Player of Week". New York Jets. Archived from the original on October 9, 2013. Retrieved October 9, 2013. ^ "Pepsi Next Rookie of the Week: Geno Smith". National Football League. Archived from the original on October 13, 2013. Retrieved October 13, 2013. ^ "Ben Roethlisberger, Pittsburgh Steelers beat New York Jets to earn first win". National Football League. Associated Press. October 13, 2013. Archived from the original on November 28, 2013. Retrieved November 28, 2013. ^ Costello, Brian (October 20, 2013). "Flags to riches! New rule helps Jets shock Patriots". New York Post. Archived from the original on November 28, 2013. Retrieved November 28, 2013. ^ Lange, Randy (October 27, 2013). "Jets Stumble in the Jungle, Lose to Bengals 49-9". New York Jets. Archived from the original on November 28, 2013. Retrieved November 28, 2013. ^ Martin, Kimberley (November 3, 2013). "Jets ground and astound, beat Drew Brees and Saints, 26-20". Newsday. Archived from the original on November 28, 2013. Retrieved November 28, 2013. ^ Martin, Kimberley (December 1, 2013). "Geno Smith benched in Jets' 23-3 loss to Dolphins". Newsday. Archived from the original on June 9, 2014. Retrieved June 9, 2014. ^ "Geno Smith shakes slump as Jets outlast Raiders 37-27". USA Today. Associated Press. December 8, 2013. Archived from the original on June 9, 2014. Retrieved June 9, 2014. ^ Slater, Darryl (December 15, 2013). "Jets fade late in 30-20 loss to Panthers, on verge of playoff elimination". The Star-Ledger. Archived from the original on June 9, 2014. Retrieved June 9, 2014. ^ "Jets beat Browns, but did they save Rex Ryan's job?". USA Today. Associated Press. December 22, 2013. Archived from the original on June 9, 2014. Retrieved June 9, 2014. ^ Martin, Kimberley (December 29, 2013). "Jets thrilled after Woody Johnson says Rex Ryan will return". Newsday. Archived from the original on June 9, 2014. Retrieved June 9, 2014. ^ a b "Geno Smith". Pro Football Reference. Archived from the original on June 9, 2014. Retrieved June 9, 2014. ^ Slater, Darryl (August 23, 2014). "Rex Ryan names Geno Smith the Jets' Week 1 starting QB, will go week to week with it". NJ.com. Archived from the original on August 23, 2014. Retrieved August 23, 2014. ^ "Oakland Raiders at New York Jets - September 7th, 2014". Pro-Football-Reference.com. Retrieved January 26, 2018. ^ "New York Jets at Green Bay Packers - September 14th, 2014". Pro-Football-Reference.com. Retrieved January 26, 2018. ^ "Chicago Bears at New York Jets - September 22nd, 2014". Pro-Football-Reference.com. Retrieved January 26, 2018. ^ "Detroit Lions at New York Jets - September 28th, 2014". Pro-Football-Reference.com. Retrieved January 26, 2018. ^ "New York Jets at San Diego Chargers - October 5th, 2014". Pro-Football-Reference.com. Retrieved January 26, 2018. ^ "Denver Broncos at New York Jets - October 12th, 2014". Pro-Football-Reference.com. Retrieved January 26, 2018. ^ "New York Jets at New England Patriots - October 16th, 2014". Pro-Football-Reference.com. Retrieved January 26, 2018. ^ Alper, Josh (October 26, 2014). "Percy Harvin to locker room, Geno Smith picked three times in first quarter". Profootball Talk. Retrieved October 26, 2014. ^ "New York Jets at Miami Dolphins - December 28th, 2014". Pro-Football-Reference.com. Retrieved January 26, 2018. ^ "Jets vs. Dolphins - Box Score - December 28, 2014 - ESPN". ESPN.com. ^ "Geno Smith 2014 Game Log". Pro-Football-Reference.com. Retrieved January 26, 2018. ^ Rich Cimini and Adam Schefter (August 12, 2015). "Geno Smith out 6-10 weeks; 'sucker punch' over $600 dispute". espn.go.com. Archived from the original on August 12, 2015. Retrieved August 12, 2015. ^ "Geno Smith gets his jaw broken in locker room over $600 debt". August 11, 2015. ^ "Jets vs. Raiders - Game Recap - November 1, 2015 - ESPN". ESPN.com. Retrieved December 2, 2015. ^ "Geno Smith: Game Logs at NFL.com". www.nfl.com. Retrieved December 2, 2015. ^ "Geno Smith 2015 Game Log". Pro-Football-Reference.com. Retrieved January 26, 2018. ^ Slater, Darryl. "Why Geno Smith felt 'pissed off' after Jets re-signed Ryan Fitzpatrick". NJ.com. Retrieved July 28, 2016. ^ "Baltimore Ravens at New York Jets - October 23rd, 2016". Pro-Football-Reference.com. Retrieved January 26, 2018. ^ Tad Haislop (October 24, 2016). "Jets' Geno Smith has torn ACL, report says". sportingnews.com. Retrieved October 24, 2016. ^ Eisen, Michael (March 20, 2017). "New York Giants sign QB Geno Smith, CB Valentino Blake". Giants.com. ^ "Los Angeles Rams at New York Giants - November 5th, 2017". Pro-Football-Reference.com. Retrieved January 26, 2018. ^ Patra, Kevin. "Giants to start Geno Smith over Eli Manning vs. Raiders". NFL. Retrieved November 28, 2017. ^ Hoffman, Benjamin (November 28, 2017). "Giants Bench Eli Manning, Opting for Geno Smith as Quarterback - The New York Times". Nytimes.com. Retrieved December 4, 2017. ^ Lewis, Edward (April 1, 2018). "Los Angeles Chargers signing Geno Smith to 1-year deal". NFL.com. ^ "Los Angeles Chargers at Cleveland Browns - October 14th, 2018". Pro-Football-Reference.com. Retrieved November 2, 2018. ^ "Geno Smith 2018 Game Log". Pro-Football-Reference.com. Retrieved January 29, 2019. ^ "NY Jets passing records". newyorkjets.com. ^ "Geno Smith: Career Stats". NFL.com. Retrieved January 2, 2019. ^ Menendez, Jenn (September 28, 2012). "West Virginia's Smith, Bailey connect on faith, football field". Pittsburgh Post-Gazette. ^ "Eugene Geno Smith". Twitter. ^ Wyatt, David (April 30, 2013). "Geno Smith - A Biography". Gang Green Nation. Retrieved June 14, 2016. 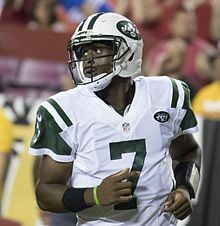 Wikimedia Commons has media related to Geno Smith.